Your girl outgrew her smocked pink dress with the Peter Pan collar over the summer, which is just fine, because this year, Eleven's got a whole new look, anyway! And as it turns out, this look is a lot better suited for saving the world. 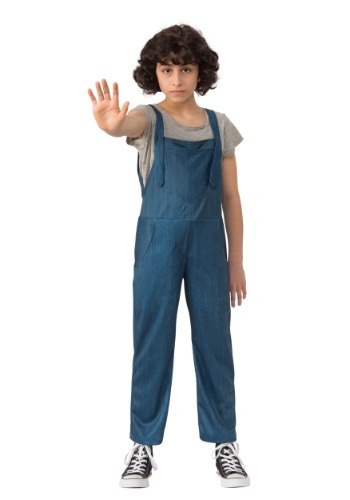 Everybody knows overalls are totally utilitarian—they make perfect sense for a kid who needs to be able sneak around, run away, survive in the woods, and ultimately defeat the Mindflayer and save her friends. They just make sense, you know? Overalls are scrappy, down-to-earth, and uncomplicated, like El...well, we guess she's a little complicated. In this officially-licensed Child Stranger Things Eleven Overalls Costume, your child can take on the evils of the Upside Down with ease. She can even enjoy a tall stack of frozen waffles before she heads off to school, which she'll be looking forward to after being shut up in a cabin all day! This pair is practically an exact replica from the show and will complete your girl's Season 2 costume perfectly. They're a true blue pair cut in the style of the 80s (none of today's modern "skinny" legs allowed!). They have side pockets, a front torso pocket, and a cool retro wash. They'll look more authentic with a bit of dirt smudged into 'em, but we'll let your kiddo take care of that. Pair 'em with a tee and high tops, not to mention our coordinated plaid shirt, and she's ready to get back out there and fight the forces of evil with nothing but her totally killer mind power! The beauty of being Eleven is that you don't need a lot of flashy clothes or a "look at me" outfit to get noticed. All your child will need to do is wear these overalls (and maybe smudge a bit of fake blood under her nose) and everyone will revere her as the coolest character on TV!